Today I have another post in the series I'm doing on Boo's fifth birthday. I started with how I made a rainbow tutu for a cake, how I made a rainbow cake and how I decorated for the party. 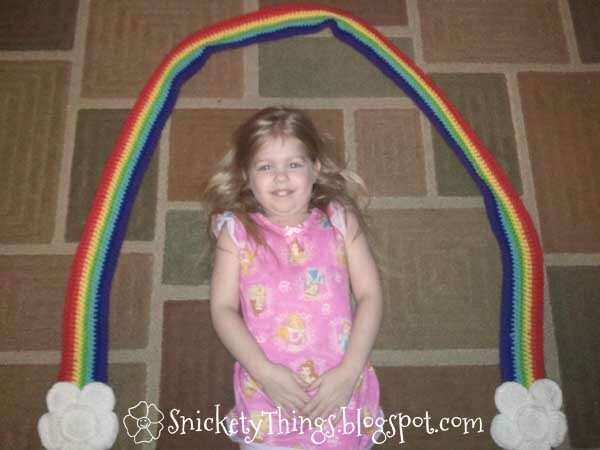 Today I am going to share with you how I made the rainbow scarf we gave her and used in the decor. Boo loves rainbows. When she asked me to make her something to do with rainbows for her birthday I knew just what to do. I wanted her rainbow to be very bright and vibrant, and I knew I didn't have the right colors at home already. I really like using all of the same brand yarn so I had to search some out. I found all of the colors I wanted at Hobby Lobby in the I Love This Yarn acrylic. I chose white, fire red, orange, yellow, limelight, turquoise, royal and grape. I really didn't follow a pattern. I just knew how I thought it should look, like a rainbow between two clouds. Choose hook appropriate for the yarn you have. I used an H hook with yarn stated above. With color 1 (red), ch 230 (this is an estimate, I made the initial chain as long as I wanted the scarf to be) turn. Row 1: Dc in third ch from hook and in each ch after to end join color 2 (orange) in last stitch, ch 2, turn. Row 2: Skip first st and dc in each st to end, join color 3 (yellow) in last stitch, ch 2, turn. Row 3: Skip first st and dc in each st to end, join color 4 (green) in last stitch, ch 2, turn. Row 4: Skip first st and dc in each st to end, join color 5 (blue) in last stitch, ch 2, turn. Row 5: Skip first st and dc in each st to end, join color 6 (indigo) in last stitch, ch 2, turn. Row 6: Skip first st and dc in each st to end, join color 7 (violet) in last stitch, ch 2, turn. Row 7: Skip first st and dc in each st to end, finish off. Using numbered diagram below, sew six of the cloud circles together as shown on the front (circles 1-6). Sew them to end of scarf. 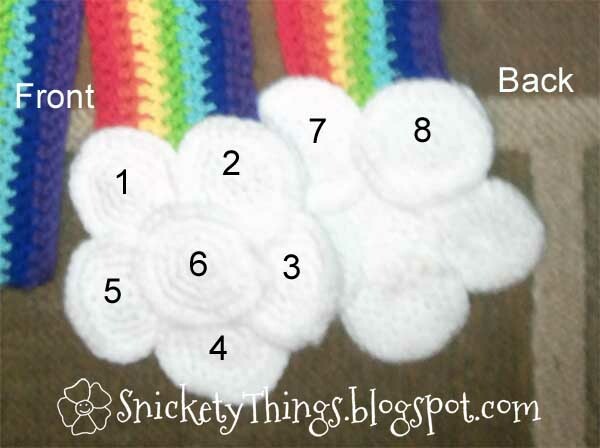 Using two more circles, cover scarf as shown (circles 7 and 8). You can make adjustments as needed for positioning. When finished, your scarf should look a little like this. Here is Boo with the scarf. It gives you a reference for how long mine was. I intended it to be hung on her window over her valance, but she just wanted to play with it so that is what she does. She wore it as a scarf a few times but it was way too long. I might have to make her another when it gets cool here again. If I make another I will update on any changes I make to the pattern. I love the bright colors and the clouds. Looks like she loved it, too. I came over from Craft Envy, and am a new follower. Please visit my blog and, if you would like to, follow back. Thanks! I will check your site out. Thank! I hope you get to make it. What a fun bright scarf-it will be great on dreary cold days. 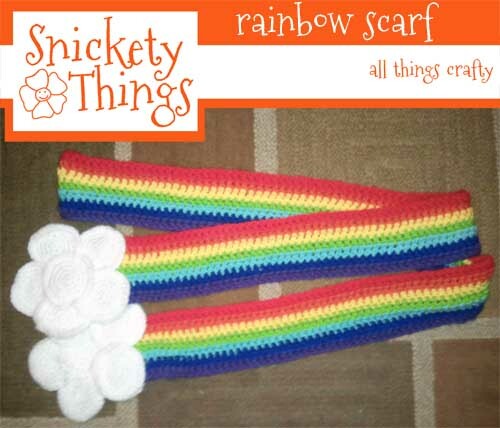 I love this scarf, it's fabulous and I think I have enough rainbow colours in my wool stash to make it! I'm new to all things bloggy and your rainbows were the first things that caught my eye! 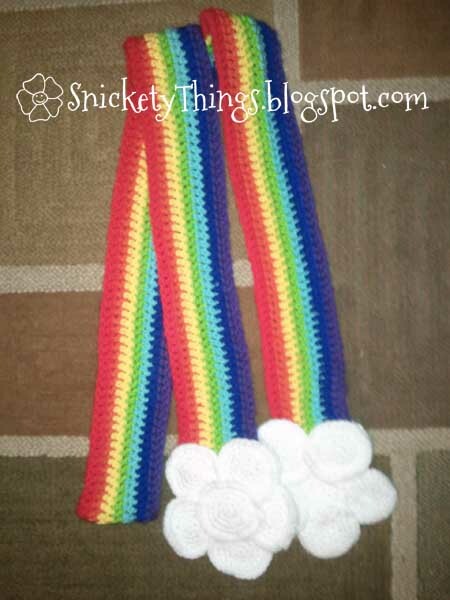 Would love it if you could check out my site, I have a rainbow blanket! How darling. Thanks so much for sharing it at my par-tay.